Nancy Pushed! Almost Falls on Sidewalk! Random New Sidekick More Timid than Bess! Hides in Car Trunk to Avoid Detective Work! Department Store Chase! Elevators Vs. Escalators! Carson Buys Nancy a New Car! Old One Had Dent! Nancy Hides Under Bed! Almost Sneezes! The Drews' housekeeper and Nancy paused to look up at a passing airplane. They were startled to hear its engines cut out. As Nancy and Hannah watched in alarm, a wounded bird plummeted down and landed among the flowers. "A homing pigeon!" Nancy exclaimed, seeing the tiny metal tube attached to its leg. "Maybe the bird's carrying a message!" LOCAL REPRESENTATIVE WILL CALL. BIRD NOT REGISTERED. SUSPECT TROUBLE. KEEP MESSAGE SECRET. Dispatch from The Department of Who Knew? : People from the Pigeon Fanciers Association have credentials. More story: Coincidentally, Hannah falls down the stairs, requiring a visit to the very same possibly kidnapped Famous Bone Specialist, who still hasn't returned home. Nancy happens to answer his phone while they're waiting (because... that's what you do when you're waiting for a doctor... you answer his phone...), and the message JUST SO HAPPENS to sound a whole lot like the message attached to the homing pigeon's leg. When the apparently un-kidnapped Famous Bone Specialist returns home, he tells Nancy that he needs help in solving a strange mystery, and that "there's nobody with whom I'd rather discuss it than you and your father". On Carson: What kind of lawyer is Carson Drew, anyway? Wouldn't the books make more sense if he worked as a PI? It turns out that the Famous Bone Specialist had been kidnapped, and that the woman he was brought in to treat was clearly there against her will -- rather than tell the police about it, he wants Carson Drew to handle it? Ten books in, and I still don't get it. He also continues to be useless when it comes to his only child's safety: Nancy is accosted by a huge guy in a dark parking lot who tells her to tell her father to back off. When she tells Carson about it, he says, "Some crank, I suppose." Yes, Carson. Because NOTHING in your world is EVER connected. She increased her speed, widening the distance between the two cars, until she approached an intersection where there was a bright overhead light. She swung around, her tires squealing on the asphalt, and stopped short, facing her pursuer. Yeesh. When it comes to concern for his child, give the man a fake tan, a wig and a flask and he could double for Dina Lohan. Shockingly, the two mysteries turn out to be connected. Poor little Johnny. He only ever shows up when an accident is necessary for plot development. Bess in a nutshell: "I don't know which is harder: to keep on a diet or keep in a secret." I've realized that poor George just doesn't have much of a personality. She's only really there to be stoic and carry the suitcases. At least Bess gets to eat and whine. The first time Nancy cracks a book on-screen? : To figure out the mysterious message she found attached to the homing pigeon, she looks up information about delphinium, larkspur and bluebells. The book doesn't help, though. She cracks the code simply using the power of her huge brain -- while listening to her favorite music program on her clock radio, no less. Enter the boys: Burt Eddleton is George's "special friend". He's described as husky and blond. Bess' boy is Dave Evans, who is rangy and fair. Nancy, of course, is paired with Ned Nickerson, who is -- of course -- tall and handsome. 8 pages later: BREAKING NEWS: Ned Nickerson is not just a pretty face! He's also a chemistry expert! More physical characteristics for villain-spotting: If you're looking at a woman, and she's "large and hard-faced", she's a bad 'un. Suspicious habits: Strutting around, cracking a whip. Harsh laughs. Heavy breathers are bad news. They clearly don't believe in the Not Guilty plea -- upon apprehension, they have a tendency to totally Spill Their Guts. Accessories: Crappy cars -- broken headlights, dangling license plate, in need of a good wash -- are a good tip-off, too. My Favorite Part: A bizarre interlude in which Nancy imagines being a Grecian maiden. She says she would pray that her "father's olive groves would bear extra well, that his vines would be loaded with grapes and his nets heavy with fish every morning." It sounded dirty to me. Maybe because it brings to mind Carson Drew, bare-chested and sweaty... among other things. Yick. Thanks for your fabulous Nancy Drew reviews--they always make my day! The best-ever Bess moment that I've found in these books is when Bess complains "I've had nothing but a hamburger since breakfast. I'm practically grown together in the middle!" It's from one of the original editions, not the shortened and edited yellow editions. I can never remember which one, though. You are so funny, Leila. Oh my heck! this was hysterical!!! This is better than the collection of nurse romance books over at tinypineapple.com -- but those are funny too. Oh God, I have *got* to stop reading these at school. I almost got caught today. Okay, this whole review was made of win, but that was my favourite. Hilarious as always. this is the scariest of all the nancy drew books, because it has old people, and old people freak me the hell out! the cover is also totally scary. look at that lady's crazy eyes and WITCH HANDS. 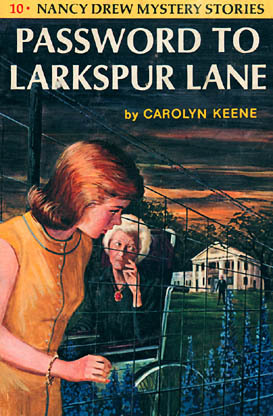 the best part about PASSWORD TO LARKSPUR LANE, and the most inspiring to a sometimes mystery-writer like myself is that every time nancy would hit a dead end, another homing pigeon would fall out of the sky with a clue attached to it! it's always so nice when the clues literally fall out of the sky and land at your feet! Have you read 'Confessions of a Teen Sleuth'? If not, you must. It is a perfect parody of Nancy Drew. so i was like what??? 3 chapters and i still dont get any of this im a 15 year old girl who love nancy drew books i know they are for 6th graders but dont u just love it when it lives in the end of your site i do bye i have to go read more see ya!!!! the story opens with Nancy tending her prize delphiniums, when a mysterious carrier pigeon falls out of the sky. The message, "Bluebells are now Singing Horses," is so odd, it causes her to contact the registry for the birds. Meanwhile, housekeeper Hannah falls and must be taken to the local orthopedist's office. Dr. Spires later confides to Carson Drew and Nancy that he was forced to tend an elderly woman for her shoulder -- the drivers of a car blindfolded him to disguise her location, leading him to believe she was a prisoner. The only clue to her identity is a bracelet with a family crest, and the doctor's belief that larkspur lane was the locale. Nancy of course immediately sets out to track the crest, discovering it belongs to the Eldridge family of St. Louis. In the meantime, the registry contacts Nancy about the pigeon, suspecting something criminal is involved. Effie Schneider, a dizzy young girl, serves as Hannah's substitute, and gets in on action when Nancy attempts to track the carrier pigeon's flight into the country. A strong woman attacks Nancy downtown, then steals the bracelet from her. Due to threats of intruders and increasing danger, the Drews accept Helen Corning's invitation to visit Sylvan Lake. Mr. Drew and Nancy sneak out of the house, and leave in Nancy's new green and black roadster for this locale. Coincidentally, Nancy rescues a young Eldridge child from a mishap at the lake, and learns an elderly relative is missing. Nancy and Helen explore the vicinity for some time, finally finding "L.S. Lane." Near the little used road is an estate surrounded by an electrified fence, and also surrounded by delphiniums. Elderly patients abound in wheelchairs on the grounds. Nancy fortunately finds Mrs. Eldridge near the fence, and finds out she is indeed a prisoner. Nancy and Helen disguise themselves as old lady and nurse, and enter using the password, "Singing Horses." Nancy reaches Mrs. Eldridge, rescues her, and gets her safely away with Helen before becoming a prisoner of the evil doctor and his partners in crime, who are kidnapping wealthy elderly people and forcing them to sign over money and securities. She escapes from her cistern prison, and sabotages their airplane, just as the police arrive. Yeah, fantastic book really. Your review is great, I love it.